For more than 30 years, Terry worked part-time in the radio industry doing play-by-play for sporting events, while his full time career was in some form of sales. In 2011, he was given the opportunity to work in radio on a full-time basis as General Manager of KATX 97.7. The combination was a perfect fit, as it allowed Terry to do the two things he enjoys–sports broadcasting and sales. KATX continues to experience tremendous growth, popularity, and recognition under Terry’s management. In 2013, Terry’s wife, Kay, joined the KATX crew as the Assistant General Manager overseeing the billing and traffic departments. While having never worked in radio, it didn’t take long for Kay to love the business. Kay is also in charge of all of the great KATX Gear that the station gives away. 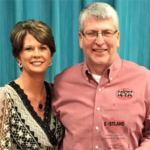 Michael Cockburn has reached his 25th anniversary in radio, with most of those years in Eastland County. He got his start in the same building that KATX moved into…then, KVMX 96.7. 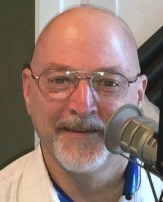 Four months into his career, Cockburn moved up to the posNews Director and held that position for both KVMX and KATX. Though Cockburn has taken a few breaks in between, he never gave up his passion for radio. 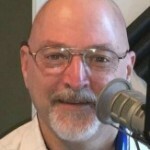 In August of 2012, Cockburn retired as a full-time announcer due to a condition that caused him to go legally blind. Born and raised in Eastland, Blakeney moved away for a short while after graduation to receive her Bachelor’s degree in Sociology from Tarleton State University in Stephenville. Eastland would always be her home though, and that’s why she moved back and planted her roots here. She met her husband, and they reside in the Eastland area with their three daughters. Ron’s first exposure to electronics came at the age of 7 when his father, the minister of their church, sat him down in front of an old 2 channel RCA sound board. His job that night was to turn down one mic after the song service and turn up the other for the sermon…He has been hooked ever since! Ron has been married to Tammy for well over 30 years and they have 3 kids, 2 in-law kids and 2 grandsons. Ron is a 3rd generation Ham Radio Operator holding the top license the Amateur Extra Class. He says he loves being “Radio Active” in his spare time. He has been honored to serve in several elected positions including as the President of the Key City Amateur Radio Club in Abilene and as the West Texas Section Manager for the American Radio Relay League.